That’s usually the first question the clerk is asked when he places the gun on the counter. Most customers solve that puzzle themselves after a moment or two. With every handgun that takes a detachable box magazine there is a slot located at the base of the grip where the bullets are fed. These are the rules for a box magazine handgun only. In a revolver, the bullets cannot be manually inserted into the receiver. So now to answer the first question correctly the bullets are inserted into a Magazine. The magazine is a detachable box that stores the ammunition in most handguns and repeating firearms. 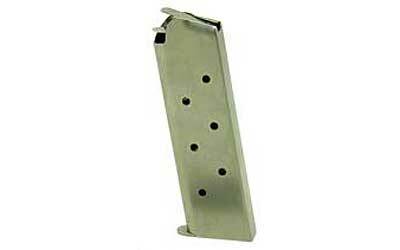 The magazines in most handguns are spring fed and loaded through a slot at the base of the pistol grip. Most magazines are assembled from inexpensive sheet metal and in some cases plastic. When purchasing a handgun, every gun itself will come with at least one magazine with some or no ammunition. There are a few things to consider when purchasing additional magazines for your handgun. Price, material and the reputation of the product and manufacturer are included. If you visit your local newsstand you will find plenty of gun magazines for sale (and that’s magazines you read, not ammunition) and compare prices with gun stores and manufacturers. Or you can go online and visits a number of highly reputable gun websites and receive advice from firearms enthusiast from all over the world. Springfield Magazine 9mm XD 16 Rounds.